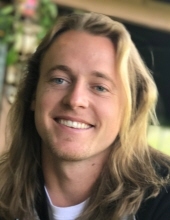 Age 25, of San Diego formerly of Mokena, IL passed away unexpectedly on Sunday, November 25, 2018 in San Diego, CA.. Evan was born in Hazel Crest to James E. and Lisa (nee Harris) Hosman. Beloved son of James E. and Lisa Hosman; loving brother of Taylor (Mladen) Arsenovic; Chad, Riley, Ryann, Cole, Kaysie, and Ava; cherished grandson of Nancy Miller and Jerry (late Kathleen) Hosman; proud uncle of Mila, Luka, and Nikola Arsenovic; also survived by numerous aunts, uncles, cousins, and friends. Evan was an Energy Sales Consultant and Designer for Solstice Energy in San Diego, California. He graduated from University of Illinois at Chicago with a Mechanical Engineering Degree and was a graduate of LincolnWay East High School. The family will receive friends at Kurtz Memorial Chapel 65 Old Frankfort Way, Frankfort, IL on Friday, November 30, 2018 from 2:00pm until time of Funeral Service at 7:00pm. Interment at St. John Cemetery, Mokena will be private. Arrangements in California were with Anderson-Ragsdale Mortuary.